Research and Markets has announced the addition of the “2016 Outdoor Advertising Outlook – Remarkably Resilient OOH Keeps on Growing” report to their offering. It’s the most comprehensive report you’ll find anywhere, offering detail on each of the four types of outdoor: billboards at $4.7 billion, transit at $1.3 billion, alternative (stadiums, malls, etc.) at $977 million, and street furniture at $414 million. Each is analyzed in detail, offering spending history since 2006 and the forecast through 2021. Analysis and detail is also offered on digital signage, which now accounts for 17% of all billboard ads. Out-of-Home advertising is the only advertising medium unaffected by the Internet. At $7.5 billion it is one of the smallest advertising media – half the size of radio advertising and one-third the size of newspapers. Yet it’s certainly proven to be the most durable and perhaps the most pervasive. Except for a slight dip in 2014, it’s the only ad medium outside of the Internet that’s shown consistent growth since 2008 and the only one expected to show year-to-year growth over the next five years. Growth is due chiefly to advertisers’ desire to reach our increasingly mobile population. There’s been an explosion of signage on street furniture, public transit, malls, and sports stadiums. Growth is also being sustained by broader creativity and interactive capabilities. An industry once dominated by flat posters is now vibrant with signage that emits sound, scent, and video, or billboards that can read the grille of a passing Ford Fusion and deliver a message, The Chevy Malibu gets more MPG than your Ford Fusion. While digital can mean disruption for print and broadcast media, it has a very different connotation in the outdoor world. Digital is good – very good. 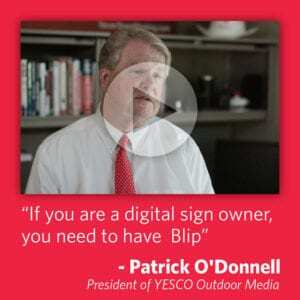 The digitization of signage has allowed a single billboard to go from delivering one poster-type advertisement per month to offering 10 per minute in vibrant, eye-catching brilliance. This year, digital signs will account for 17 percent of all billboard revenue, up from 4 percent a decade ago. 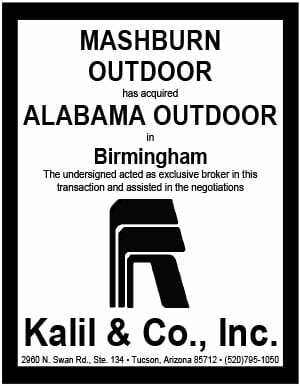 Outdoor is very much a local business. Names such as Clear Channel, Adams, Outfront, and Lamar may be prominent, but the average outdoor company employs 11 people and grosses $3.5 million annually. In all, there are 2,190 out-of-home advertising companies. Even for the big companies, almost two-thirds of ad revenue comes from local establishments. The industry, however, is not without issues. Legislation in four states has banned billboards, and countless municipalities have instituted some sort of restrictions over concerns about distracted driving or beautification. In addition, the plethora of options has fostered competition that has driven pricing down. This report details the growth of the out-of-home industry and examines its future – a future that by all accounts is quite rosy.